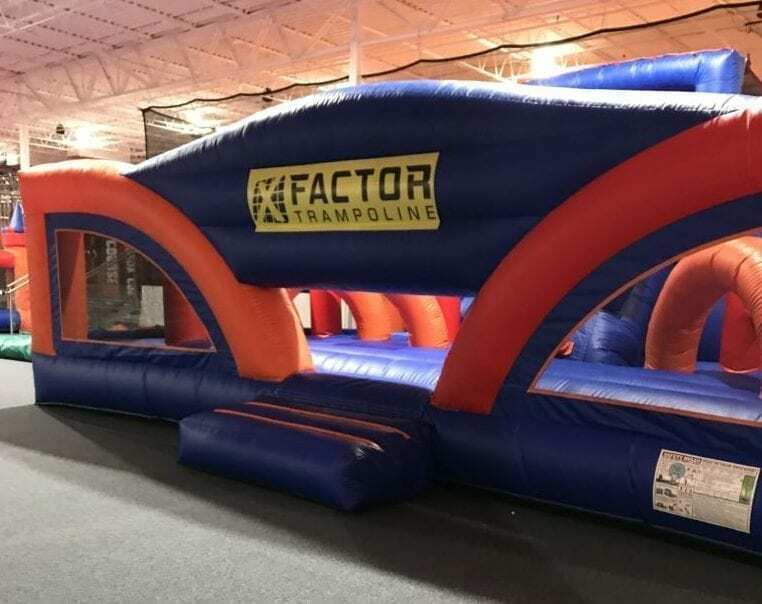 I was browsing Facebook recently when an ad popped up for a new place called XFactor Trampoline Family Entertainment Park. I felt like it was a “sign” because my son had been practically begging me for months to take him to a trampoline park. 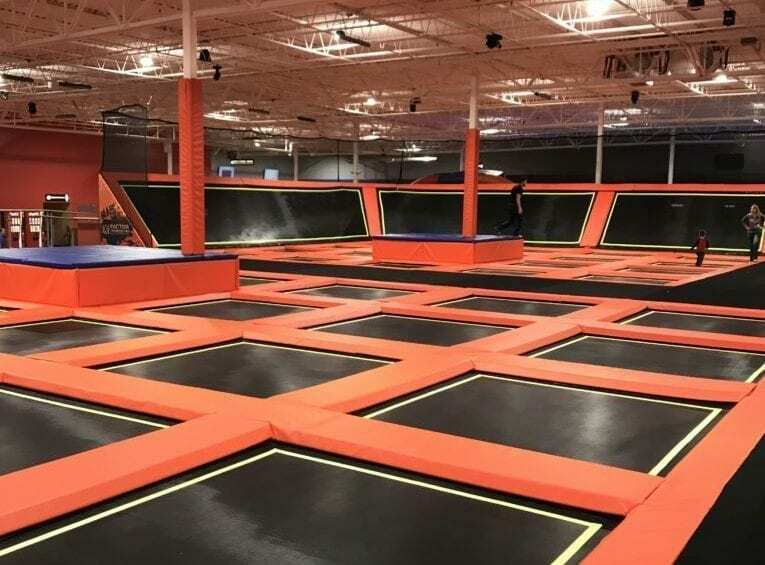 I agreed to take him not really knowing what to expect from this brand new trampoline park, but I was intrigued by this new business that fills the formerly vacant space in Mundelein (Oak Creek Plaza, where Hobby Lobby was located). What I found was a multi-attraction paradise, and my five-year-old wanted to do it all! When we walked in, I had to sign a waiver on the computer and then pay for our jump time, a routine process for all jump places. The prices seemed comparable to other jump places in the area with options for one-hour, two-hours, a day-long pass and a membership. We chose the one-hour jump and for my five-year-old and it was plenty of time. One you have chosen your admission option, your child receives a sticker that displays the time that the session expires and your child sticks it onto their shirt. We also had to purchase special socks with grippers on the bottom, however, you do get to keep them so it is really only a one-time purchase. Then it was time to play! 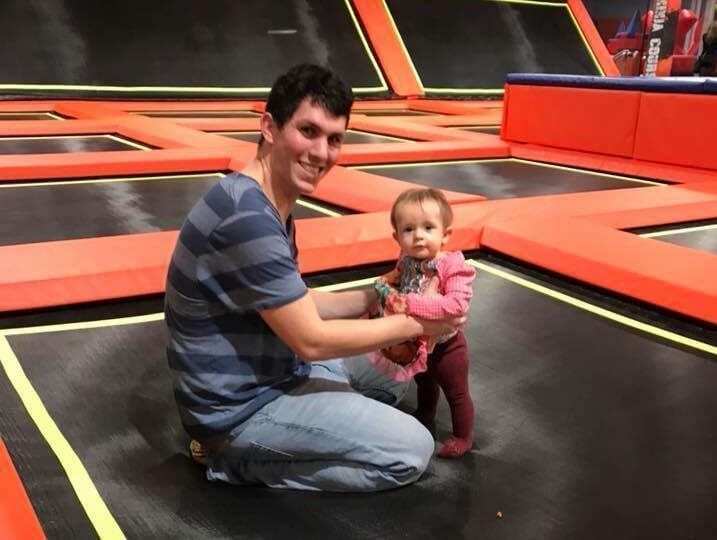 My son first started jumping on the regular trampolines. Two entire sides of the upper level are covered with trampolines. It reminded me of the trampolines that you see typically at other indoor trampoline centers. 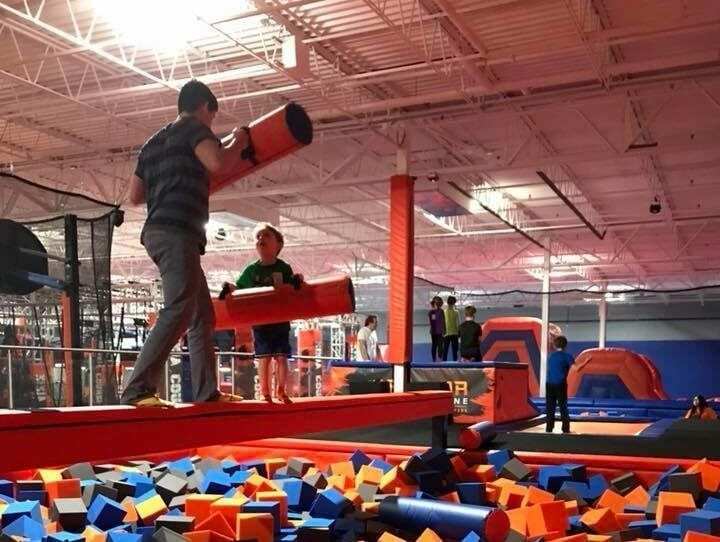 I did find that this area got crowded quickly with teens wanting to try out flips, so I directed my son to the other activities. Probably the most impressive attraction here, in my opinion, is the American Ninja foam pits. 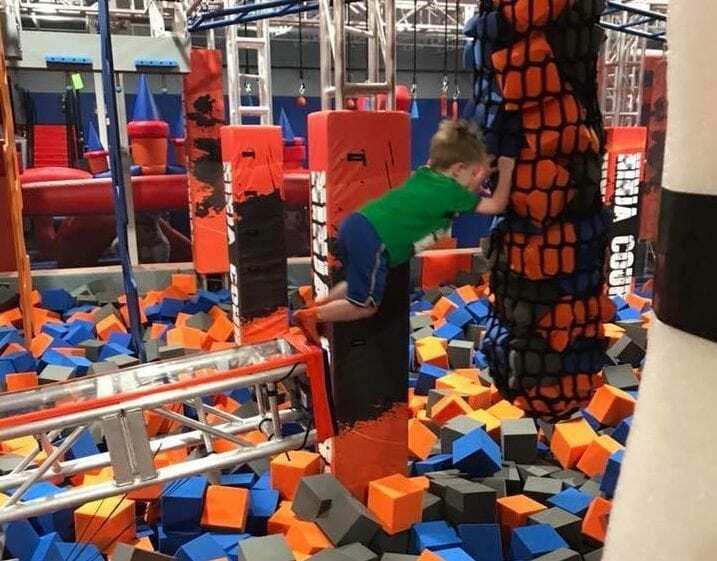 My son saw this and immediately shouted “I want to have my birthday party here.” It looks like a small-scale version of the obstacles you see on TV, but suspended over foam blocks. Both my five-year-old and my boyfriend immediately got in line for this attraction. With its ramps, ropes, and swinging obstacles, I could see this being something that kids of all ages would want to try over and over until they master it. While my five-year old wasn’t quite able to do it all, I noticed that some kids who were slightly older could master many of the stunts. 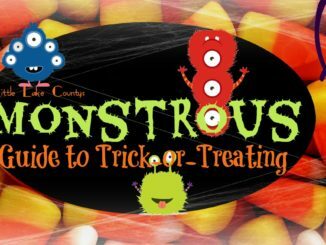 I would say it is probably best for kids ages seven and older, however anyone can try it out and still have a blast. Other popular areas include the trampoline dodgeball court, and the American Gladiators-style balance beam battle. There was no line for dodgeball, and kids can play it all day long if they wanted. The line for the balance beam wasn’t too bad either. This place is seriously like heaven for energetic kids. Younger kids will enjoy the two giant inflatables with obstacle courses inside. My five-year-old and my 10-month-old were able to go into these alone. While I often avoid trampoline parks with my youngest child, these inflatables seem to be a good option for younger children to play on. XFactor isn’t just about jumping. 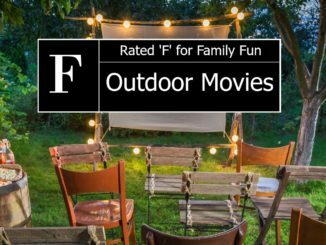 There is so much more here that sets it apart from other entertainment centers. There is also a full arcade and a rock climbing wall. The downside to the rock climbing wall at this point though is that there are no harnesses. 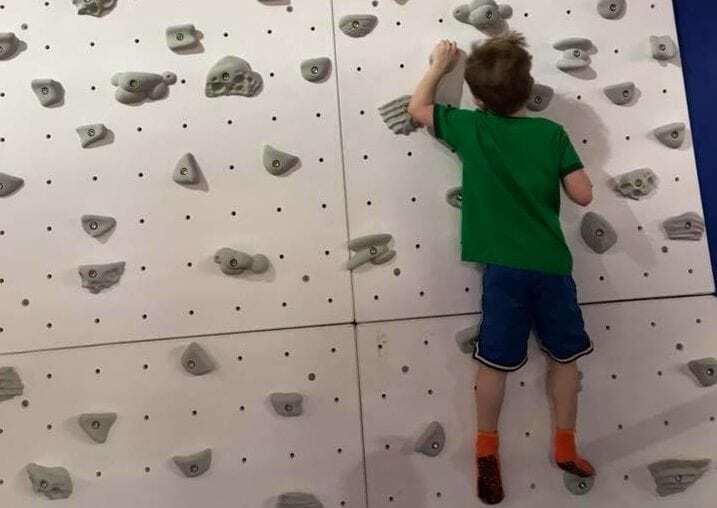 I would only let my five-year-old climb as high as I could reach. Also when we were visiting, the arcade was just being delivered, so I can’t tell you much about that feature except that my son was asking me to let him play the one shooting game they had set up. When you work up an appetite from all the fun, XFactor also has a full-service cafe. They don’t just have the typical foods either. They have food such as burgers, pizzas, nachos, sandwiches, and more. If you ask for a cup they will give you a cup with a lid to fill up with water in the drinking fountain. We got away with this until my son realized that they sold “REALLY GOOD” Icee flavors here. At least the prices weren’t bad! Overall, XFactor Trampoline Family Entertainment Park is a great place for kids and adults to burn off some energy. We’ve already had a couple of playdates here, too, and it was a hit for both the parents and the kids. I think this will be a new favorite hangout for us. You need to purchase grippy socks. They sell them there, and you can take them home and reuse them any time you come back. The men’s bathroom does not have a changing table in it. Lockers are available for purchase, however, we just kept our stuff with us. They have tot time daily on weekdays from 10:00 a.m. – 1:00 p.m. This is a great opportunity for a morning playdate while the big kids are in school. Disclosure: All thoughts and opinions are the writer’s own and no compensation was received.